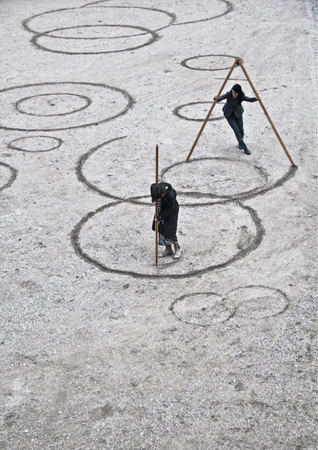 Molly Haslund, CIRCLES – Drawing upon the universe, 2013. The vibrant and multifaceted Danish art scene is once again coming together to present all the best from the national and international contemporary scene. With two fairs and a 10-day art week, Copenhagen will be buzzing with activities in the name of art. The Danish online magazine kunsten.nu is behind the new collaboration between 55 art spaces from in and around Copenhagen. Copenhagen Art Week connects and calls attention to the bubbling and diverse Copenhagen contemporary art scene, embracing museums, art centers, galleries, art fairs and project spaces. The objective is to affirm Copenhagen as a metropolis for high-quality contemporary art, accommodating both mainstream and narrow artistic activities and, in an interesting way, to open up the whole scene to a wide audience. Salon conversations, performances, guided tours, artist talks and a gallery night will, along with already scheduled activities at the various exhibition spaces, generate engaging meetings between the public, art professionals and artists and offer an insight into the undertakings of the art world. Alt_Cph is Copenhagen’s alternative art fair. Each year the 1,000-square-meter production and exhibition space becomes a vibrant meeting place for experimental artist-run spaces and initiatives.. Alt_Cph 14 Assemble takes place at FABRIKKEN / The Factory of Art and Design, a production and resource center in Copenhagen, where professional artists and designers work in 53 studios and the cathedral-like factory hall. For more information, interviews and press photos, please contact Copenhagen Art Week’s Press Officer Anne Riber at presse [​at​] kunsten.nu or on T + 45 40 89 42 24.